Kamchia resort is located 25 km southeast from Varna, its near to village “Dolen Bliznak”, in the area “Kamchiya sand”. The area is declared as a reserve in 1951 with purpose to prevent the biggest riparian forest in Bulgaria. The most famoust place in the area aroung river Kamchia is complex „Romantica”. The region is famoust with its beautiful sandy beaches, which start from the thumb area and end near the other resort village “Shkorpilovci”. Near the estuary there is a new hotel complex. Kamchia is located a 30 minutes away from the Varna airport, you can book your car from our office on the airport. The main attractions are the flora and fauna – some parts of the forest the trees reach height 50 m and there over 40 species, some of the trees are about 150 years old. In the river there are lilies and lianas. The animal worlds near the river includes over 200 species – birds and mammal. The place is good for fishing, because there are 20 kinds of fish. A pristine and hardly accessible beaches offer plenty of clams, for people which are looking for adventures, and a sunbathing for the visitors, which want to relax. The nature in this area is unique, because of a dense overgrown pristine longose forests. Some beaches are hardly accessible, but it worth to see. Longose forests and lianas are on the territory of 1200 ha, and are most concetrated on the estuary of the river. The area except the plants, is very rich of animals. You can enjoy of great recreational vacation, long walks, clear air, fishing, camp, and also a boat trip along the river. You can also taste a traditional Bulgarian cuisine. It is located near Kamchia. In that area you can enjoy a quiet vacation, and to see a beautiful relief hills. Obzor is a popular resort, very preferred because of it possibilities for a sea vacation, combined with a green hills and a good prices. Access is very easy by your rental car. If you plan to visit Kamchia and have not yet booked your car, you can do so by using our reservations form. If you are traveling from Varna, LowCostCars has an office to Tsar Osvoboditel 17 A, or from the airport, where you can pick up your car on the spot. 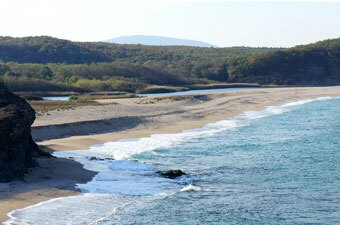 Kamchia is the perfect destination for a day trip from Varna.